This might be the first question that goes through your head: What is MyInfo? We have all heard of BMW's ConnectedDrive, but MyInfo is a new keyword for all the bimmer fans. MyInfo works pretty much the same as its European version, named ConnectedDrive. Bmw partnered up with Google on this to deliver the system for the North American market. 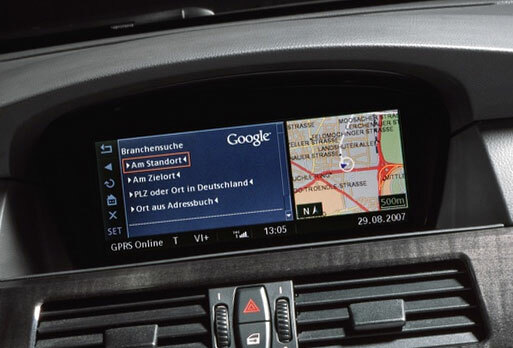 Google's most innovative product named, Google Maps, will be part of the MyInfo system and it will improve the the current BMW Assist Navigation System. A mouse click will allow up to 10 destinations to be sent to your screen and the most fascinating part is that all the date is shareable, you can simply have the data uploaded to your car or to others people BMW's equipped with the navigation system. Coming from an engineering background, I can't even describe how fascinating this whole process is. Having the ability to look up an address on Google Maps on your laptop or office computer and then upload it to your BMW Assist through the web interface, it is simply amazing. The future has no limits now. 1. Tell the other person what is the address of your current location and hope that they have a navigation system, so they can find you. 2. Give them step-by-step direction and facing the possibility that they might call you a few times when they get lost. 1. Since you have a smartphone, you will have access either to the Google Maps application on your phone or to the Google Maps mobile site. There, you can look up your current location, on your phone of course, and send it to you friend's BMW Assist. Pretty cool, isn't it? 2. But what if you're a geek and you have a GPS built in your phone? Now, you're really cool and sky is the limit in this situation. You can basically go now in your Google Maps application and without trying to look up your location, the GPS will point exactly on the map where you're stationed, and from there, all you have to do again is to upload the location to your friend's car. Before I'll let you go and think about the endless possibilities, have you noticed in the video above that Firefox is used instead of Internet Explorer 7? I find it pretty interesting, but knowing how much the European Community hates Microsoft, it is expected to see the open source browser. Ok, enough with the geeky stuff for today, let's get back to our bimmers and spy photos.